Winnie is an Angus/Simmental calf who was born on December 3, 2018. She started life intended by a farmer to end up being killed young to be sold as beef and steak. But, Winnie had a different destiny in store for her. It quickly became clear that Winnie’s back legs don’t function the way they are supposed to. This meant that Winnie had to hop around using her front legs to carry most of her weight. She was nicked named Little Hop and that likely saved her life since it is always harder to kill those who are given names. So, when it became clear that Winnie would never make it to full weight and still be able to carry herself on her bad back legs, the farmer decided to offer to let Winnie find a new home. 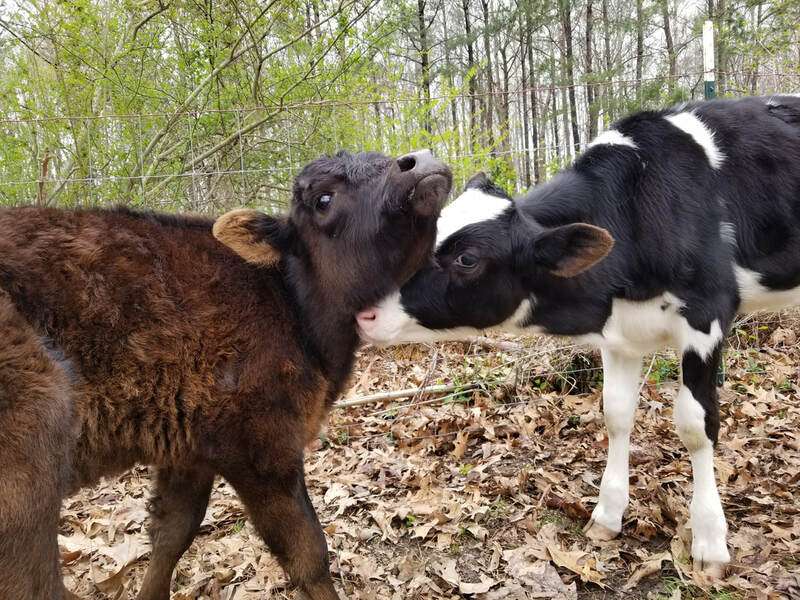 ​When she arrived at Life with Pigs Farm Animal Sanctuary, Winnie was scared of humans but wanted to meet her big sister Jenna the Calf who Lived. Jenna was scared at first, but quickly they became best friends. And then Winnie learned to trust humans by watching how Jenna trusted us. Within the first few days, Winnie was already letting us pet, hug and love on her. And now she is our cuddler. She is also full of energy and determination. Nothing seems to stop her from moving and running about the yard. Even when her goofy sister Jenna tries to play headbutt with her, she is able to hold her own. We are working on getting her either braces or a cart to help her as she gains weight and carrying herself becomes more difficult. But, one way or another, we are going to make sure that Winnie and Jenna are wandering around and hanging out for years and years to come.